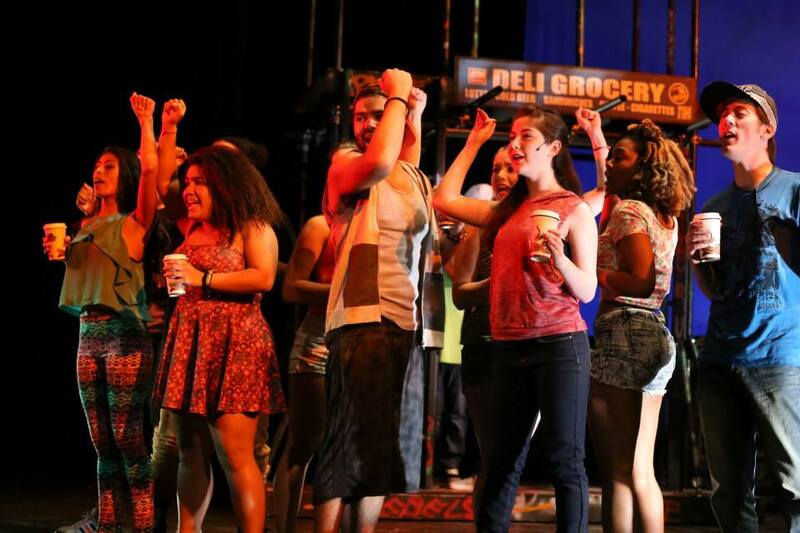 I directed/choreographed In The Heights for The Chappell Players Theatre Group at St. John's University after having just lived at 180th and Broadway--a thriving area of Washington Heights--for the year previous. It was quite a surreal experience to bring the musical to life when you actually have the firsthand real life in your recent queue. What I love about this musical, and what I emphasized with this undergraduate group of performers, is how political it is. The continuing gentrification of this area and many others in our country gets glossed over far too often and the displacement of poorer and less privileged members of any community demands attention. Sonny, the comic and yet clearly most political character, says, "The rent is escalatin', the rich are penetratin'. We pay our corporations when we should be demonstratin'," while Usnavi poignantly questions, "In five years when this whole city's rich folks and hipsters, who's gonna miss this raggedy little business?" Lin-Manual Miranda was begging the question about what true diversity means in one of the nation's most proudly varied. In order to create this world, I didn't have to stretch the students' imaginations too far: as late teens/early 20 somethings thrown into the undergraduate abyss, they already know what it feels to be made to feel unimportant, to have to fight to be heard. I tapped into these similarities they all shared to create our own neighborhood and comradery and then urged their passions for a very real struggle. Combine this with the material's unabashed cry for dreams to be dreamt and we had the makings of a magical experience. As with any educational theatrical experience, the extraordinary lies more in the process than the product--but I was proud to watch this group do more than what anyone expected of them.